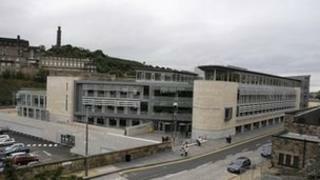 Staff at Edinburgh City Council could be set to benefit from the introduction of the living wage from January next year. More than 2,000 workers would earn £7.50 an hour, which is five pence above the recommended rate. The proposal will be considered at a full council meeting in December. Earlier this week the Scottish Government announced it would be paying the living wage to employees working in parts of the public sector. The living wage is calculated to reflect the basic cost of living and is based on the principle that work should pay enough to provide for the essentials of life. It is an entirely voluntary scheme for employers and the wage is updated every year. Bill Cook, Edinburgh City Council's vice convener, said: "For me it's simply a matter of fairness. People should get a decent wage for working. "It is a strange logic that claims that it's essential to give the rich more and the poor less in order for the economy to work." The same person without a pension will increase take home pay by about £110 per month or £1328 per year.